This week, we've got a radio active element that's good at keeping time but also has some fire in its belly. With more on the chemistry of rubidium, here's Tom Bond. In a way, the story of rubidium starts in 1859 when the German chemists Robert Bunsen and Gustav Kirchoff invented the spectroscope and in turn opened the door to a new age of chemical analysis. Before that the Bunsen burner had been developed to investigate the coloured flames they saw when combusting various metals and salts. Bunsen and Kirchoff were able to work out that, by using an external light source and a prism, they could separate the wavelengths of emission spectra in these flames, and so the spectroscope was born. 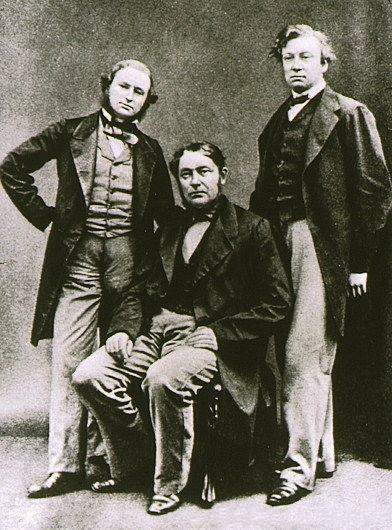 caesium was their first major discovery using the spectroscope, followed quickly in 1861 by rubidium, which was detected by the red flame produced when they burnt the mineral lepidolite, which contains small amounts of rubidium. Bunsen and Kirchoff realised this colour came from an unknown substance and were then able to purify a small amount of rubidium. Its name is derived from the Latin rubidus, meaning deepest red, which relates to the colour seen after excitation of the single electron in its outer shell. Rubidium is actually one of our commoner elements and depending on which information source you look at, it is about the 16th most abundant element in the Earth's crust, with a concentration somewhere around 90 parts per million. Although it is relatively abundant compared with other elements such as copper, it is not found in a pure state but as a minor fraction in various minerals. Most rubidium is derived as a by product of lepidolite extraction which has the primary goal of producing lithium. Pure rubidium is often obtained by reduction of rubidium chloride using metallic calcium at around 750°C and low pressures. Rubidium is one of the alkaline metals, as group one of the periodic table are otherwise known. The alkali metals have a single electron in their outer shell, which makes them highly reactive with oxygen, water and halogens, and also means that their oxidation state never exceeds +1. As you move down Group 1 of the periodic table the reactivity of the elements increases which is in line with the increasing energy of the outer electron. While lithium and sodium added to water form part of school chemistry experiments, the extra reactivity of rubidium means the equivalent reaction requires caution and is not for the faint hearted. When a small amount of rubidium is chucked into water, the effect is pretty impressive, and in fact is so violent that the liberated hydrogen can ignite. Rubidium is so reactive that it can catch fire spontaneously in air, meaning it has to be stored under inert conditions. In terms of their physical properties, the elements of Group 1 are soft metals with low-melting points. Rubidium is no exception to this rule, being silvery-white and melting at 39°C. The element has two naturally occurring isotopes. 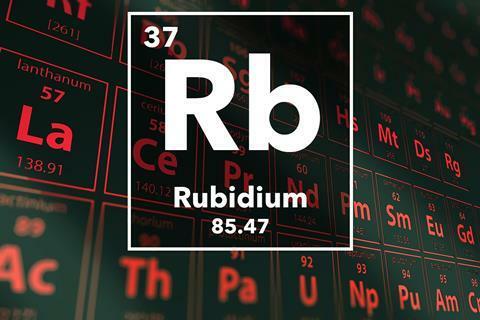 Rubidium-85 is the dominant form, accounting for 72 per cent of the total, while most of the remainder is the radioactive rubidium-87, which has a half-life of 50 billion years. The radioactive isotope decays to form strontium-87. This process gives a way to age rocks, by measuring the isotopes of rubidium and strontium with mass spectrometry, then calculating the ratios of the radioactive forms to their decay products. Although it is chemically interesting, the element has relatively few commercial applications at present, but the amount of research activity suggests many possibilities exist. One current use is in atomic clocks, though rubidium is considered less accurate than caesium. The rubidium version of the atomic clock employs the transition between two hyperfine energy states of the rubidium-87 isotope. These clocks use microwave radiation which is tuned until it matches the hyperfine transition, at which point the interval between wave crests of the radiation can be used to calibrate time itself. Rubidium was chosen to investigate the unusual properties of extremely low-temperature fluids, known as Bose-Einstein condensates which have zero viscosity and the ability to spontaneously flow out of their containers. Their existence was predicted in 1925 by Einstein himself, who extended the work of Indian physicist S. N. Bose to suggest bosonic atoms at temperatures close to absolute zero would form their lowest possible energy state, which might allow quantum behaviour to be studied. By the way, bosons are defined as atoms with integer spin, while multiple bosons can occupy the same energy state. It was not until the end of the 20th century that technology advances made cooling elements close to absolute zero feasible. The first pure Bose-Einstein condensate was created using rubidium-87 by a group from the University of Colorado in the US, and for this achievement they earned the 2001 Nobel Prize for physics. Rubidium is not particularly harmful to humans, and once in the body its ions are rapidly excreted in sweat and urine. Rubidium chloride has been used to study the transport of potassium ions in humans, since rubidium ions are not naturally found in the body and when present they are treated as if they were potassium. In a similar way, because it tends to collect inside cells, especially tumours, the radioactive isotope Rb-82 can be used to locate brain tumours. The low toxicity of rubidium is confirmed by a study from 1971 which aimed to assess the feasibility of using rubidium chloride as an anti-depressant, since similar effects had been observed in monkeys. After being given 23 grams of rubidium over 75 days, a volunteer showed no harmful side effects. It does though make you wonder whether equivalent clinical studies could take place now. Meanwhile, clinical applications of rubidium in psychiatry have yet to come to fruition. 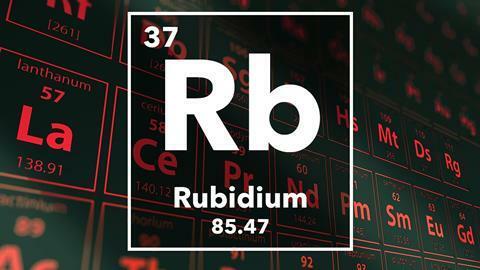 So there we have rubidium, the explosive red element number 37 in the periodic table. So this explosive element may have minimal commercial applications but can be used in atomic clocks and has isotopes that can locate brain tumours. Not bad considering it was stumbled upon when analysing the mineral lepidolite. That was Tom Bond with the story of rubidium. Now next week we meet the element that's made our modern lifestyles possible. A mixture of powdered tantalum and tantalum oxide is used in mobile phone capacitors, components that store electrical charge and control the flow of current. What makes the element ideal for phones, and for other dinky electronic gadgets, such as handheld game consoles, laptops and digital cameras, is that the metal is extremely good at conducting both heat and electricity, meaning that it can be used in small components that don't crack up under pressure. And John Whitfield will be explaining why we have tantalum to thank the next time we play the latest computer games, take hundreds of photos on holiday or when we're downloading this podcast on our laptops. So join John on next week's Chemistry in its element. Until then, I'm Meera Senthilingam and thank you for listening.